Two trips inside Yayoi Kusama’s 'Infinity Mirror Room' at the DMA. Two very different experiences. I am a patron of the arts. Each year, I pay for the most affordable (but no less distinguished) “Supporter” membership at the Dallas Museum of Art. You’re welcome, art. 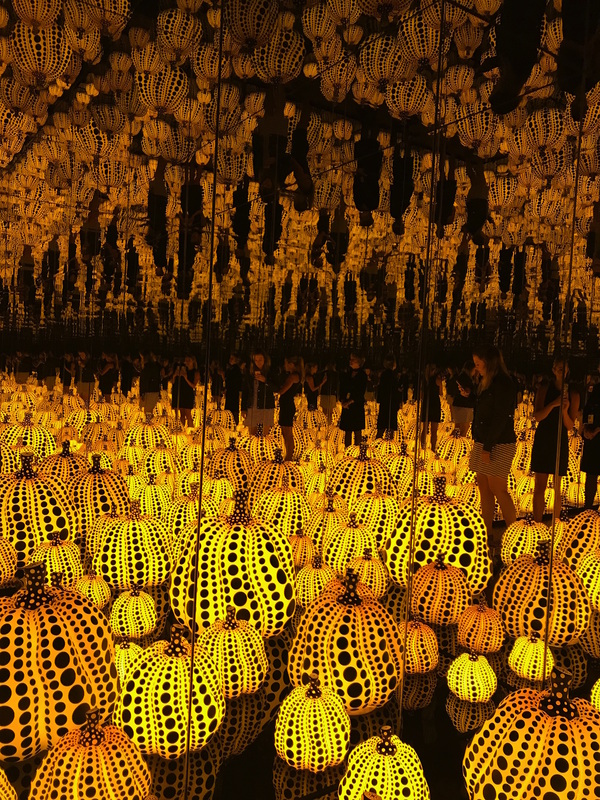 Because of my vital patronage, I was able to glimpse one of Yayoi Kusama’s immensely popular “Infinity Mirror Rooms,” All the Eternal Love I Have for the Pumpkins, before it opens to the public on October 1. I’d seen my LA- or New York-based friends post pictures of various surreal and celestial mirrored rooms on Instagram, so I was acquainted with the Japanese artist’s work. I was also acquainted with the denouncement of Kusama’s installations as Instagram-bait, although that’s a little silly, considering her first mirror room debuted in 1965. Selfie-lure or not, I’m not above a social media photo op, so I booked my viewing time slot, assembled a cute but casual, museum-appropriate outfit, grabbed my iPhone, and headed to the DMA during the first weekend for members-only viewing. As I waited in line on my first visit, I realized I’d left my phone in the car. But that’s fine, right? I can hang out in a line without my eyes on a screen for all of 10 minutes, right? I can give my full and total attention to the person I brought with me to this exhibit like a decent human being, right!? Well, yeah actually I could. I’m not a total garbage person. Plus, as we neared the entrance of that tiny room, and I braced my senses to be completely overloaded, I assumed I wouldn’t need my phone. I would be so enraptured by the concept of infinity and general pumpkin-ness that I’d completely forget about social media for the strictly-timed 45 seconds we’d be allowed inside Kusama’s vision. Not quite. Here’s the thing. As we learned scouting Instagram for the “10 Most Beautiful Homes in Dallas” this year, some things just look better through a camera lens. For me, All the Eternal Love I Have for the Pumpkins is one of those things. Not that it wasn’t interesting. An “Infinity Mirror Room” is a sight to behold, and I really do think the DMA exhibit is worth beholding. But without my phone, I found the allotted 45 seconds to be about 20 longer than I needed. I kind of get why that person touched that pumpkin! The infinity of it all looked more daunting and otherworldly through the lens of my phone on Sunday. It’s as though being that close to the actual mirrors revealed their tricks. In a photo, the room’s sharp corners are softened or unseen. The lines between each wall are blurred or hidden. Even the cartoonish pumpkins look more whimsical. Call me a millennial monster who can’t properly appreciate the artistic vision of one of the most famous living Japanese artists. That’s fair. But I was captivated — just more so in scrolling through photos marked with the hashtag #KusamaPumpkins than I was inside the actual exhibit. That being said, it’s a big deal that Kusama’s work is in Dallas, and it’s an incredible opportunity to not only witness, but immerse yourself in the vision of an artist who influenced Warhol. Just don’t forget your phone. Our dining editor Catherine Downes with editorial director Matt Goodman, exploring option #2.